I read an article a few weeks ago about a program that is aimed at getting girls into learning how to code as it’s a highly male dominated industry. This really interested me as I’m one for always wanting to learn a new skill and let’s be honest, coding is kind of cool. Now, I think I’m fairly computer and internet savvy but stick some code in front of me and I’m lost. I know a few basic tricks but not at all how to build a website and so on. Not only did I think about learning to code from the incredible woman that is Karlie Kloss but also scrolling through tumblr and coming across an ask someone had sent the lovely Gemma Styles (you all should read her column on The Debrief because we have one smart lady in our ranks!) 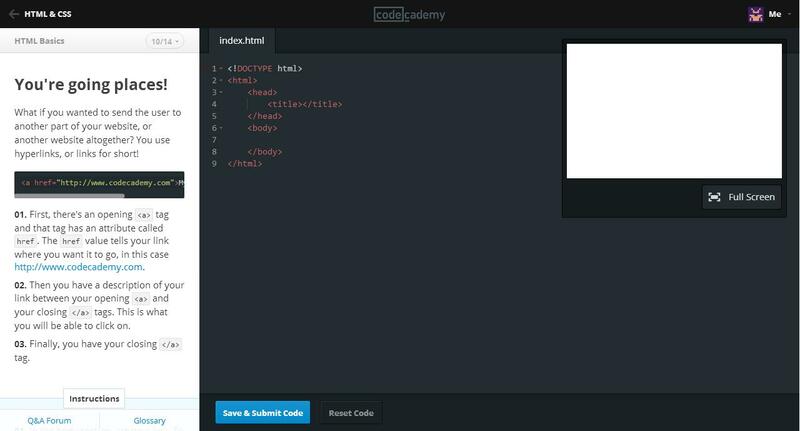 where she left a link to codecademy and boy, I’m obsessed. This website is a gold mine for free coding lessons from building your own website, basic to in depth HTML and CSS lessons, building apps and so on. They’re really broken down so taking in the information is really easy and most importantly THEY’RE FUN! If my ICT lessons with Mr Odd Socks had been this interesting I might have actually paid attention. I still passed but c’mon I know spreadsheets are important and all but did I honestly need to spend a year learning a few basic functions? I think not. Will you give it a go? I think as the world gets more digital it's an important skill to have. I’ll do an updated progress post if people would be interested in that. This is a great introduction and guide. My mother is a coding wizard! She wants me to learn so badly, and every time she has sat down to teach me, I learn a little here and there. I think it's so cool, but at times it can seem so overwhelming. It's basically another language. Good luck learning, I'm sure you'll conquer it! Self motivation is the biggest key, I think, to learning at the end of the day! I have been wanting to learn how to code for some time now - i have a terrible memory and i'm not sure I could remember the necessary bits! Might have to take a look at this site!